The flattening of the yield curve has attracted some commentary, but it appears to be telling us very little. 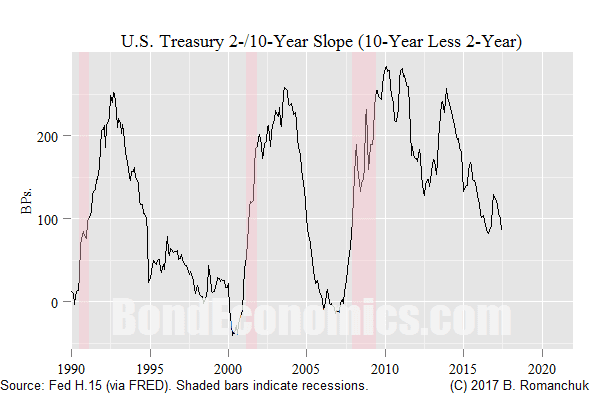 By itself, the 2-/10-year slope (above) is not at a particularly interesting level; one should expect flattening during a rate hike cycle. Current bond market pricing is consistent with an eventual recession, and so arguments that the Treasury market is "in a bubble" appear to be hyperbole. Many commentators and strategists like using markets that they do not trade as cyclical indicators. Since most commentators are not particularly interested in the bond market, but are keenly interested in equities, they like using the bond market as an indicator for the future prospects for stocks. Those of a bearish disposition enjoy pointing to the flattening yield curve, saying that this a bearish signal for equities. I am in the minority who is more interested in the bond market than equities. I might attempt to use the equity market as an indicator for future economic prospects, but I have my doubts about its reliability. The stock market is very good at backcasting recessions that started a few months earlier, which is not particularly useful. There is a 50% chance of recession within 5 years, and the New Keynesian Fed once again drives the policy rate to 0% (or below!). The 5-year spot rate ends up at 0%. I find it hard to see the above scenario exercise as being implausible; the possibility that there is no chance of a recession on a 5-year horizon seems far more implausible. There are a number of potential catalysts for a global recession, but I would note that I have been writing that since I launched my web site almost four years ago. 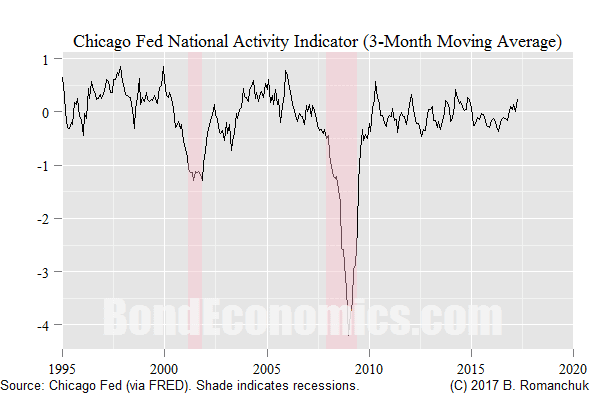 If we use the Chicago Fed National Activity Index (above) as a broad indicator, it is not signalling an immediate recession. Who Cares What the Fed (and Fed Watchers) Think? It is easy to look at shorter-dated forwards, and argue that they appear too low relative to rate hikes expected (for example, in 2018). Central bankers (and central bank watchers) over-interpret such pricing. ** The curve being 25 basis points low in 2018 does not say a lot about long-dated bonds. Forward curves always tend to be smooth; they do not have the jerky movements that characterise the path of realised policy rates (which are the result of central bankers reacting in a panic to the business cycle). The Fed "dot plots" incorporate the utterly unrealistic forecast that the policy rate will revert to some long-term average and stay there forever; market pricing is starting to incorporate the return of the policy rate to zero. This means that we should expect the market forward rate to be somewhat below the long-term average in the "dot plots." 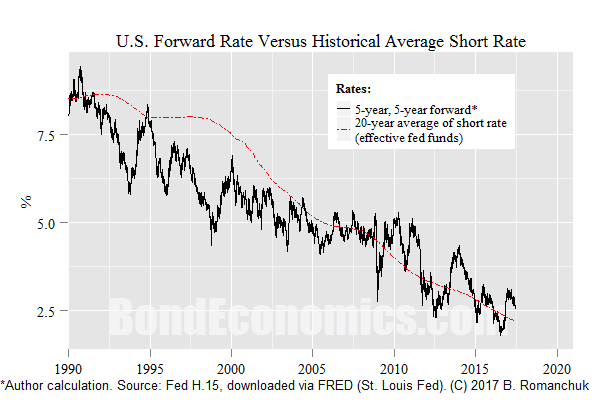 Since the forwards will not fall off a cliff at some future date, the end result is that forward rates will smoothly cut below the "dot plot" forecast. Even if you agree that the Fed will hike by more than is forecast in 2018-2019, you are on the wrong side of tail risk. Unless Janet Yellen gets all Volcker on us, the upside on a short rates position is only a rate hike or so in your favour. However, if something goes wrong, rates will be back at zero in a flash, and you are down multiple rate hikes in losses. Meanwhile, most investors have portfolios that are exposed to financial crisis risk, and so this tail risk is a wrong-way risk for your entire portfolio. This asymmetry limits the attractiveness of short rate positions. For things to go seriously wrong for the bond market, you either need to have faith that a recession is multiple years away (which will allow the New Keynesian baby steps could to become somewhat more forceful), or there is a total change in the reaction function at Federal Reserve. I do not follow conventional beliefs about interest rates; to a certain extent, the nominal interest rate is arbitrary. This is in opposition to beliefs that interest rates have a "natural" level (or the equivalent), which implies that deviations from that cyclically-adjusted level will have a large effect on the economy. If you believe that there is a "natural" rate of interest, then current rates cannot be far off from where they should be, given the lack of acceleration in the economy. Correspondingly, there is little reason for anything other than the baby steps the Fed has been taking. However, if nominal interest rates are arbitrary, there is nothing stopping the Fed from hiking rates to 5%. In other words, the main risk to long positions is personnel changes at the Federal Reserve. The U.S. Treasury may be mis-pricing the path of Fed rate hikes. However, in the absence of radical changes of philosophy at the Federal Reserve, this mis-pricing will be corrected at a snail's pace. * In case the bond mathematics is unfamiliar, the 10-year yield is approximately equal to the average of the spot 5-year rate and the 5-year rate, 5-years forward. The 5-year yield should equal the expected average of the short rate over the next 5-years, which is a plausible forecasting exercise. If we have no reason to disagree with the 5-year pricing, our determination of the fair value of the 10-year depends almost entirely on whether we agree with the level of the 5-year, 5-years forward. ** For Federal Reserve staffers (and those closely affiliated to them) to complain that the bond market is mis-priced requires a lot of chutzpah. According to these people, quantitative easing was supposed to lower term premia (I disagree, for what it's worth). To then chide the bond market for too-low forward rates requires an impressive amount of cognitive dissonance. The current economic trajectory will produce negative growth in the 2nd qtr. of 2018. Of course, it all depends upon your definition of a recession. Because economists don't know a debit from a credit, we will have a prolonged economic depression and the U.S. will default on its debt. Secular strangulation is nothing other than the idling of savings within the framework of the commercial banking system. This is the sole cause of both stagflation and secular strangulation. All savings originate within the payment's system. Saver-holders never transfer their savings outside the system unless they hoard currency or convert to other National currencies. The only way to activate savings (put savings back to work) is for the saver-holder to invest/spend directly, or indirectly via a non-bank conduit. Unless savings are expeditiously utilized, a dampening economic impact is generated. I.e., money velocity falls. As professor Lester V. Chandler originally theorized in 1961, viz., that in the beginning: “a shift from demand to time/savings accounts involves a decrease in the demand for money balances, and that this shift will be reflected in an offsetting increase in the velocity of money”. His conjecture was correct up until 1981 – up until the saturation of financial innovation for commercial bank deposit accounts (the widespread introduction of ATS, NOW, and MMDA bank deposits). Remunerating IBDDs exacerbates this phenomenon. The expiration of the FDIC's unlimited transaction deposit insurance in Dec. 2012 is prima facie evidence. Can't see any reason for a default, other than for ideological reasons.